When you arrive at Fretz RV to pick out your new or used recreational vehicle, the sheer selection and number of options may overwhelm you. Consider starting your search with fifth wheel trailers. These models all vary in features, but their basic design offers numerous benefits to small families and individuals. Towing a very long trailer increases the likelihood of swaying and loss of control. However, it can be hard to fit the entire family in comfortably unless you tow something large. Fifth wheels feature an overhanging extension that sits over the bed of the hauling vehicle. This creates sleeping or storage space without lengthening the body, keeping most models very compact. Some still reach up to 45 feet, but they often offer at least six feet of length in the front as well. Any RV will be stable and still when properly parked. However, many trailers and other tow-behind models sway or swing as they go down the road. This can make it hard to drive straight as well, especially when the trailer is quite large and heavy. Maneuvering up or down narrow mountain roads is easier with a fifth wheel because of the design’s namesake. The literal fifth wheel sits near or under the hitch and helps stabilize the trailer in turns. While you will still need to keep your towing vehicle in tip top shape, your fifth wheel itself won’t feature any moving parts to break down. Small mechanisms like the leveling jacks are easily replaced if they do break. In a pinch, you could buy a new towing vehicle while on the road and avoid being stranded due to engine problems. There is no need for a long delay during repairs when you can just swap vehicles and keep the fifth wheel instead. 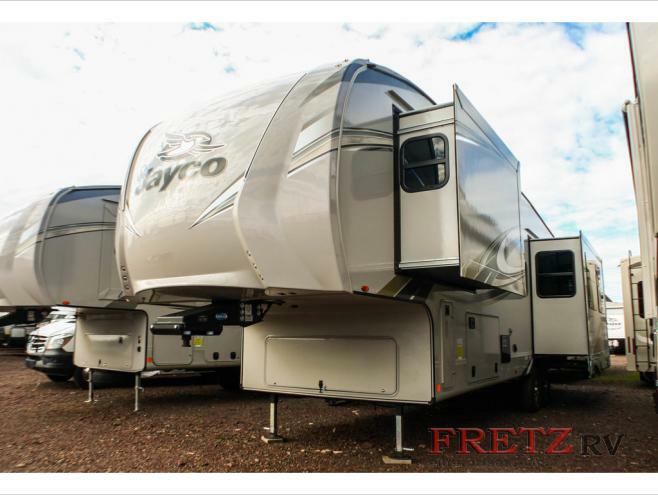 Most fifth wheel trailers at Fretz RV are quite luxurious and well equipped. You will really feel like you are at home or in a comfortable hotel when camping in the wilderness. Large screen televisions, full kitchens, and bathtubs make these trailers more than just basic equipment and housing for a road trip. Don’t forget to stop and see us at Fretz RV if you’d like to explore the possibility of owning a fifth wheel trailer.